Yahoo has added a new feature to its mobile web messenger. 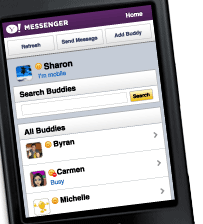 Yahoo messenger can now be used to send free SMS text messages to your friends on their mobile phones for free. This new feature can be used from any mobile phone with GPRS facility either smartphone or standard feature phone. You don’t need to install any application on your mobile phone, just visit m.yahoo.com/messenger and send text messages. How to send free SMS from yahoo mobile web messenger? Visit from your mobile web browser. Now click on Send message on the top of your mobile screen. Now enter your friend’s mobile number and message and click on Send button. You can read more about it at Yahoo Messenger blog. Good bye i am going to try? Isn’t this an old feature? Wherein if your message will be sent as an SMS if your friend/buddy is offline and he/she registered his/her mobile number in yahoo. Although there is a limit to this service because you can only send message from YM to his/her mobile phone if he/she replied. nice feature, only problem is the limit of no of messages you can send. Yes, that’s the only problem. User need to reply to the messages to recieve more messages. That’s the bad thing. This is a good feature by Yahoo. But i think VOIP services are blocked in certain countries so i don’t think we can use yahoo to send free sms to anywhere i the world.